Our beginning on Tone 1 offered the Inspiration for a new Dream in Unity with Spirit. On Tone 2 we are offered a choice “to be or not to be” as we consider our own Intention. Tone 2 reflects our Human perspective of Duality. It’s our Human Nature that reasons by comparison. We compare ourselves to others and consider the way we may be more or less capable to manifest a dream. From a Higher State of Being we can recognize that our thoughts of limitation and failure are only an instinctual response. Our way to conquer our fear is by turning within for a Divine Discernment. Deer/MANIK promises a Spiritual Tool to overcome every limitation. Star/LAMAT is a Day Sign of Harmony and Balance, as a Star shines its light equally in all directions. We were created from Stars to become the Personification of Light. LAMAT’s totem is the Rabbit that brings a day of “pure luck” that can multiply our Light to Abundance. The 2nd Uinal and the 2nd Tone magnify the energy of self-reflection. We are “all stirred up” in the chaos of change. How we manage it, will depend on how quickly we re-member our Intention of Spirit. This is the most vulnerable stage of the germination process. We’ve barely broken through the soil to receive the Full Light of Spirit. To the extent we are vulnerable, so are we Blessed and Empowered by our new Consciousness of Spirit. We have the Spiritual Tool to Stand in our Truth and any other Tool of Spirit we might need along the way. We can Bring Our Self back into Unity through an Intention of Faith IN SERVICE to the Whole. The Faith we held for our Self will take on the Power of Divinity when it is sought on behalf of the Whole. Deer/MANIK is showing us that our Spiritual Power is Exponentially Greater when it is being Accomplished in Agreement with the Creator. The Duality of Tone 2 upholds the Principle of Correspondence from the Ancient Wisdom of Hermetic teachings. Correspondence is the balance of all things. It relates the Divine Feminine and the Divine Masculine, representing equal, yet opposite ways of Being. The Principle applies to every thing. We still see this Wisdom reflected in languages that incorporate the masculine and feminine. Our Highest Transformation will bring these energies into perfect balance. Our Mother Earth is the Divine Feminine and the Womb of our Creation. The Sun is the Creator, the Divine Masculine. When we commit our Self to “show up” as Unconditional Love for the Whole, we magnify the Light of the Creator’s Intention. Like the Hand of Deer/MANIK, when we reach up to grasp the Ether that completes a circuit to Divine Energy, we share the Divinity of Creation. I hold the Faith that our Prayers and Intentions of Spirit are magnified when we stand in agreement. The Bible says, Matthew 18:19 Again, I tell you truly that if two of you on the earth agree about anything you ask for, it will be done for you by My Father in heaven. Our Faith is Multiplied to Abundance when we Choose to Stand in Agreement with one another’s Hopes and Dreams. We are not alone. Someone else holds the same prayers. We don’t have to make comparisons that are “of the world,” but instead IMAGINE the Power we Hold when we Stand in Faith Together. We don’t have to look back from our Human Perspective. We’re being inspired to make a Higher Leap of Faith in the Correspondence between the Above and the Below. Like the Master Number 22 that doubles the Power of our Life Purpose, holding an Intention to Stand in Agreement with the Creator, we can give Life to an Intention with the Power to bring into Balance the Duality of Heaven and Earth, Body and Soul. We were created to become a Personification of the Creator’s Light. To all my relations, as we continue to reach for the Light, may we see beyond our vulnerability to the vitality and strength of a healthy young sprout. May we Imagine a Dream of Faith in Service to the Whole. May we imagine how we would “show up” as Love. We don’t have to be Perfect, only Humble. 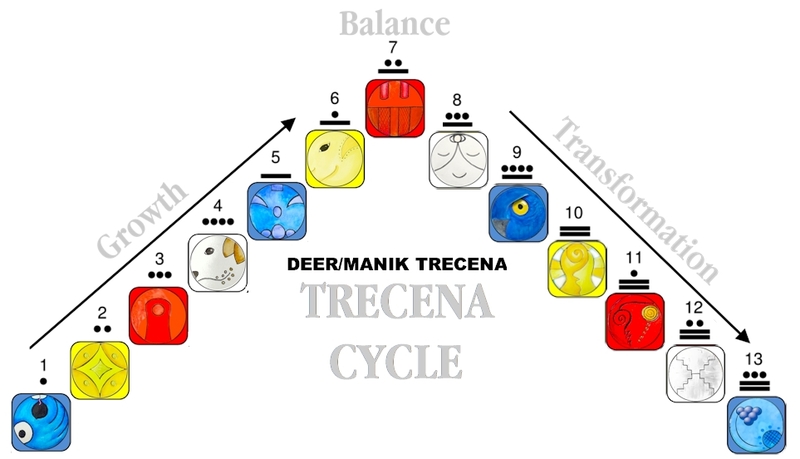 The Deer/MANIK trecena is prepared to show up with a Spiritual Tool for every limitation. MANIK is the protector and the Hand of God that moves with us through this trecena. When we feel challenged or alone, may we remember that someone else is saying the same prayer. May we imagine ourselves standing with them. May we Acknowledge our Shared Divinity for the Awesome Gift that it is. It is an Offering from the Consciousness of the Creator, who wants us to Know and Share the Blessing we are Given. I stand with You in a Dream for Happiness, Harmony and Love, Multiplied to Abundance. I dream that we stand in Faith together, Knowing the Light that Shines in the Darkness. May we remember the Power of Correspondence between the Above and the Below.